Images of a dead sperm whale that washed ashore in Indonesia with nearly six kilograms of plastic waste in its stomach have sparked outcry from environmentalists and wildlife protection groups around the world. And one expert says that unless humans change their ways, it's only a matter of time before a similar scene unfolds on the shores of British Columbia. "My first reaction was 'Not again.' 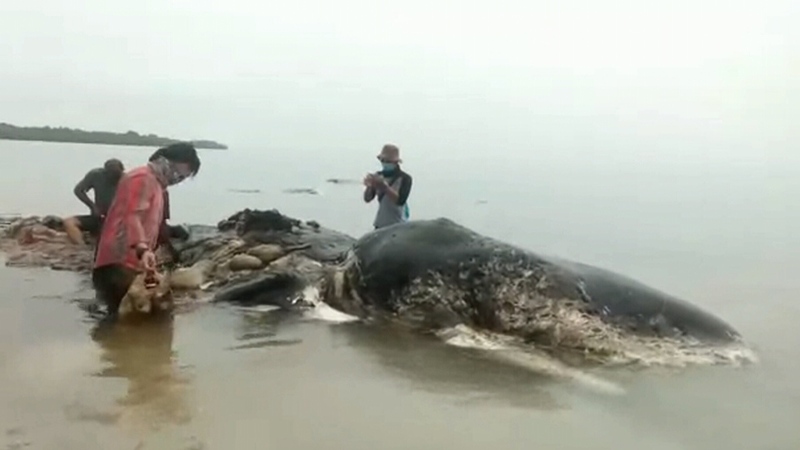 This is now I think the fourth time this year that a sperm whale has washed ashore with huge amounts of plastic in the stomach," Andrew Trites, the director of UBC's Marine Mammal Research Unit told CTV News. "It's really troubling to think that we may, down the road, start to have some of our sperm whales wash ashore with stomachs full of plastic." The rotting 9.5-metre carcass discovered by rescuers from Wakatobi National Park Monday contained 115 plastic cups, 25 plastic bags, two flip-flops, a nylon sack and more than a thousand other plastic items. "It seems to be a growing pattern that we're finding in sperm whales. Some of them are washing ashore with huge amounts of plastic," Trites said. "We're not talking little tiny pieces. We're talking huge pieces." The professors said this type of plastic consumption is a growing trend among fish and squid-eating whales such as sperm and beaked whales. While it's unclear why the animals are consuming plastic, Trites said it's likely that they're either mistaking the waste for food or treating it like toy, adding that "it's accumulating if they're not able to get rid of it." According to a study published in the journal Science back in January, Indonesia is the world's second-largest plastic polluter after China, producing about 3.2 million tons of mismanaged plastic waste a year, nearly 1.3 million of which end up in the ocean. Trites said similar whale deaths have been observed in Spain and Germany, and while B.C.has far cleaner waters than Indonesia, "it is just a matter of time before one of our sperm whales washes ashore with a stomach full of plastic." According to researcher, the problem of ocean plastics started with humans and needs to end with them too. "I think the ultimate solution is people have to use less plastic," he said, adding that it's up to government to come up with policies that change consumer behaviour on a large scale. "It is a question of people taking responsibility. It's probably a question of government leading the way to ensure that we don't take the easy way out to use something that is that disposable and harmful to the environment but make wise choices for the future." A dead sperm whale that washed up in Indonesia is seen in this image from Nov. 19, 2018.